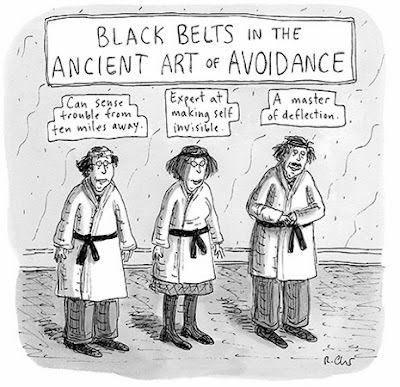 Roz Chast is one of my favorite cartoonists. Her work is often featured in The New Yorker, which is where I found the cartoon below. Though I doubt this was her intention, Chast actually did a good job summing up one of the key components of practical self-defense: avoidance. For example, consider "Can sense trouble from ten miles away." I sort of read this as a simplification of the principles behind Gavin de Becker's excellent book The Gift of Fear. If you can sense trouble (and you can, if you trust your instincts) avoid it! How about being an "Expert at making self invisible"? Despite our exhibitionistic society, being noticed is not always a good thing. I had a good friend who was a life-of-the-party/class-clown kind of guy. Unfortunatley, he couldn't really turn it off, and more than once he encountered critics who were willing to express their disaproval of his antics with their fists. It is better to avoid than to run; better to run than to de-escalate; better to de-escalate than to fight; better to fight than to die. I think Roz Chast's cartoon illustrates some of those principles nicely.